Fantastic quality, not cheaply made. Love the 'gold' detail, perfect size. Sits very nicely on a large desk. I got this as a gift for my niece's home office and she loved it! I knew she'd love it because we're always making boss jokes when we're discussing our jobs. I would buy this product again with other phrases. My dearest friend in the world has been working hard on her earning her MBA, while still working full time. Somewhere along the way her company decided to promote her. I'm glad they see the value in her that is so apparent to me. She is SUCH a big deal. It'll be perfect for her desk! You place on your desk either facing you or away from you. Nice quality but slightly smaller than I expected. As pictured, seems to be made of nice materials - just slightly smaller than I expected. I bought this for my husband to put on his desk in his home office. 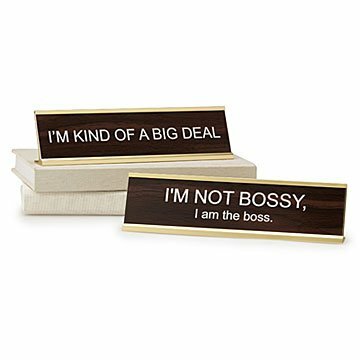 Embellished with cheeky sayings, these retro-styled signs work overtime to liven up your office, study, or thinking spot.